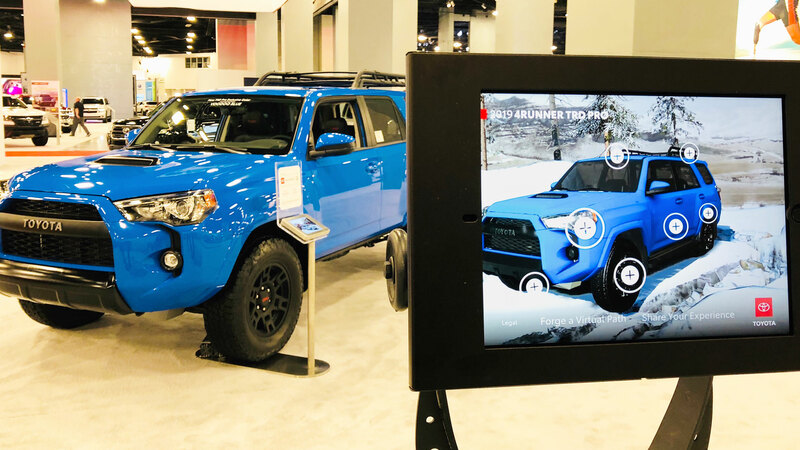 When our friends at George P. Johnson shared their interactive exhibit concept designed to immerse auto show guests in the new 2019 Toyota TRD Pro series trucks, we knew an MR (Mixed Reality) experience would be the perfect way to do just that. Mixed Reality gives us the ability to leverage the physical vehicles that are on site and overlay a digital and interactive layer to an activation. This would keep customers engaged at the 2018 – 2019 auto show circuit around the country. 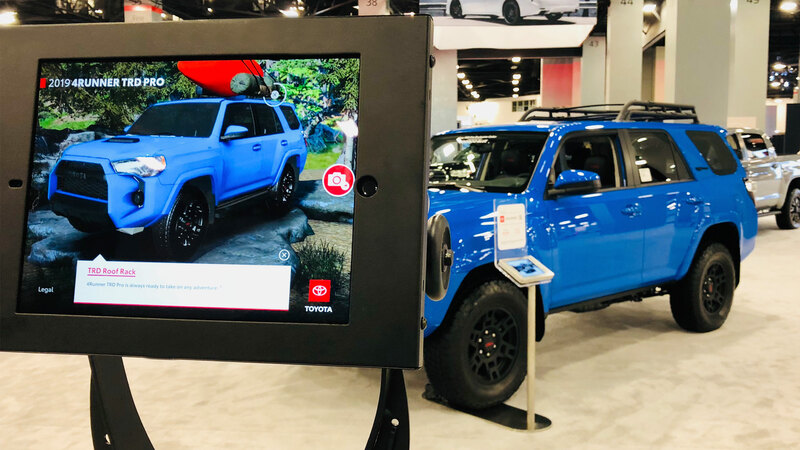 Our development team created an App that uses the latest iOS ARKit platform to track the Toyota TRD Pro trucks allowing for an exclusion-based AR experience. 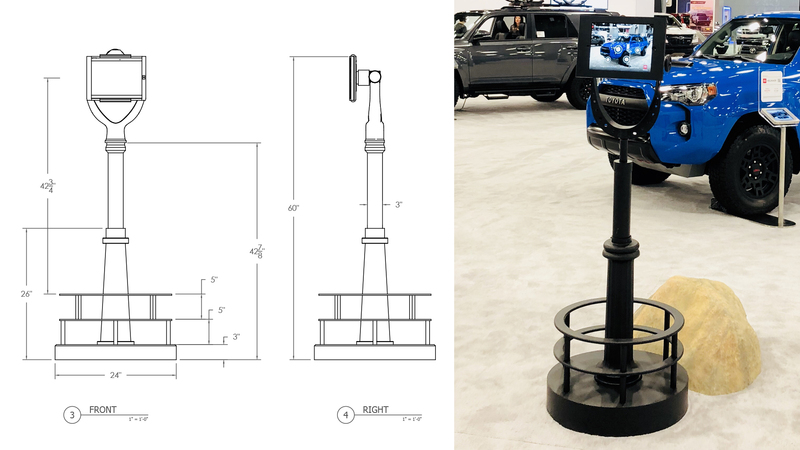 People who attend the auto shows can approach these freestanding viewers outfitted with iPad Pros positioned around the various vehicles to learn more about their special features. 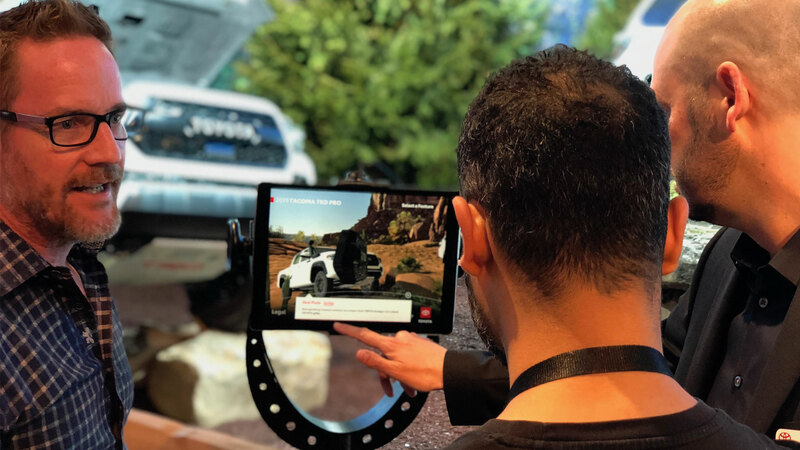 The App utilizes the iPad Pro camera and tracks the physical vehicle, which enabled us to place a series of hotspots that appear on the vehicle when it was displayed on the screen. 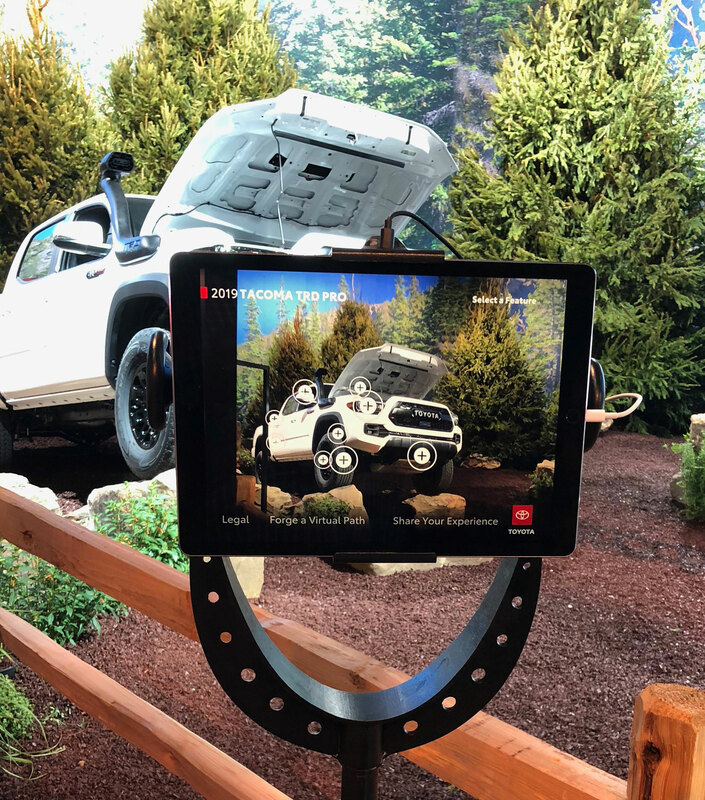 The touchscreen allows the users to tap on each hot spot to activate specially created animations to showcase the technologies that help make Toyota TRD Pro series some of the best off-road vehicles in the world. 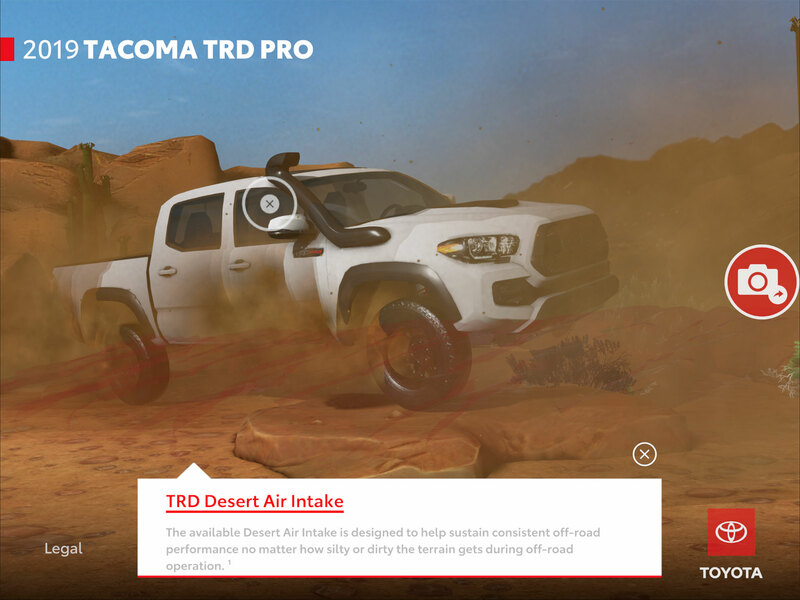 Each individual vehicle’s features are highlighted with animated AR vignettes ranging from showcasing how the shocks look like as the vehicle rolls over a rocky surface or how the snorkel air-intake works as it enters a cloud of dust. Because the iPad Pro is a 12.9” inch screen, it was large enough for multiple users to view the display at the same time. Users can change the vehicle paint color, dynamically strap camping gear to the roof rack, or fill the truck bed with various outdoor gear including an ATV or Kayak! 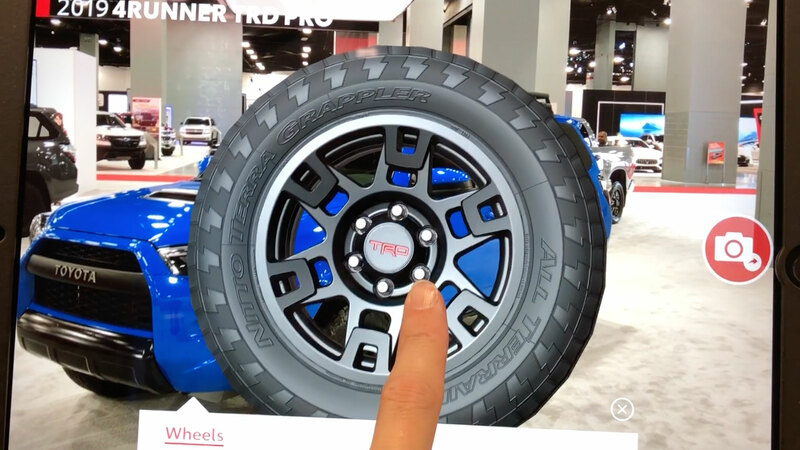 The “Forge A Virtual Path” AR Mode allows car enthusiasts to check out various environments while the vehicle is parked. 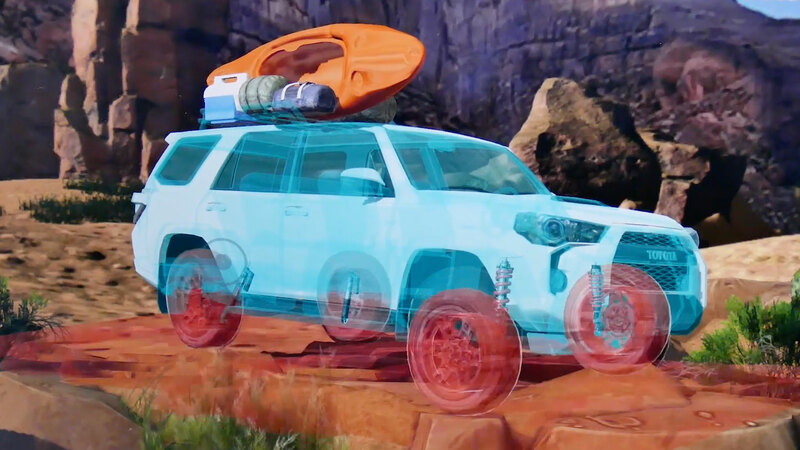 The shot below shows the 2019 4Runner TRD Pro with the Roof Rack loaded-up in a computer-generated AR wooded setting. 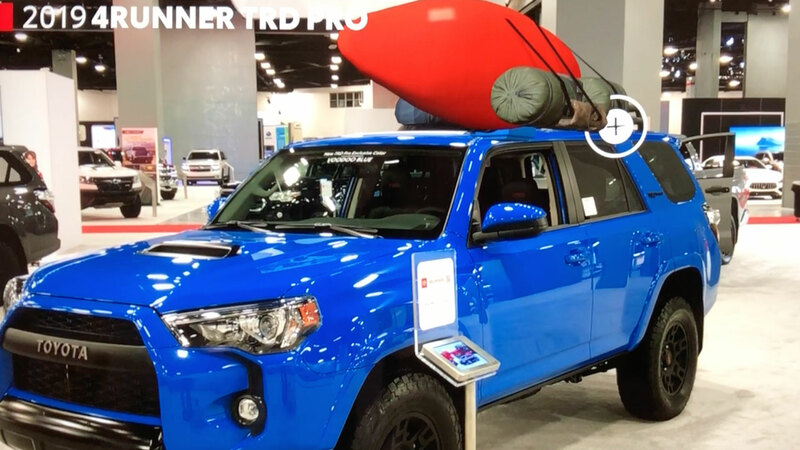 Below is an image of the 2019 4Runner TRD Pro on display at the Miami International Auto Show with the AR camping scene being dynamically displayed on the screen. 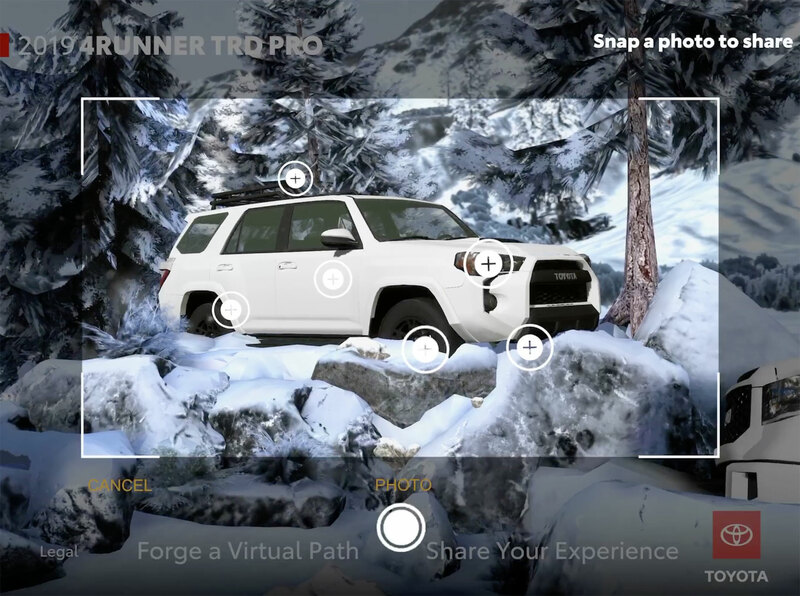 Another “Forge A Virtual Path” VR Mode displays the 2019 4Runner TRD Pro in a winter snow setting. Shots of the TRD Roof Rack and TRD Front Springs. Shots of the Grille and Headlights activated on the 2019 Tacoma TRD Pro. Shots of the Tundra TRD Pro in the Voodoo Blue Color and Skid Plate. Social Share tools allowed customers to take a photo and post to their own social channels. 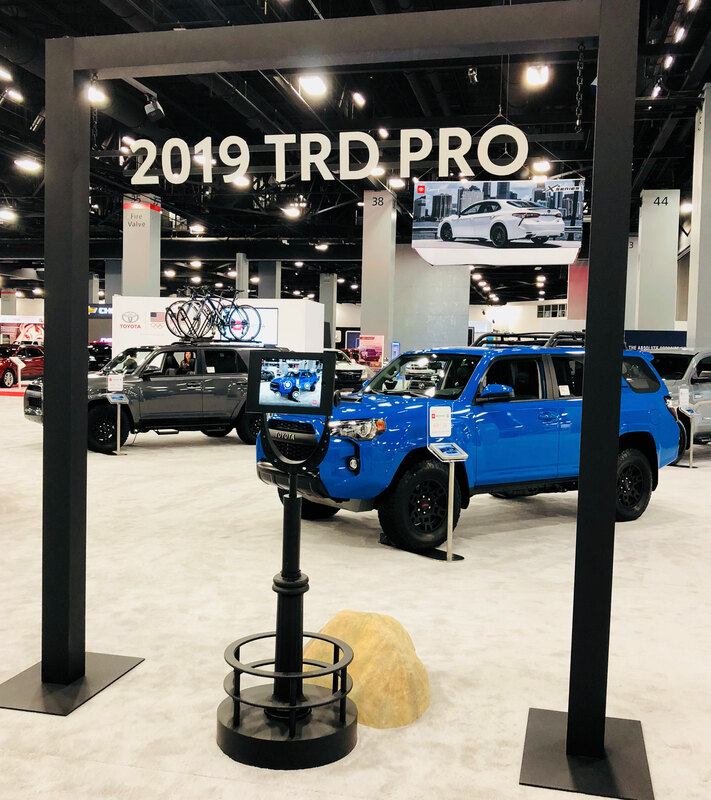 The custom-made stands are 60” tall and allow the user to move the viewer in any direction to experience all that the Toyota TRD Pro display has to offer both digitally and physically! This unique, never been done before experience is being rolled out, starting at the 2018 Miami International Auto Show and the 2018 Orange County International Auto Show. If you plan on checking out the exciting work, see it next at the LA Auto Show at the end of November!